This year started with a gas conflict between Russia and Ukraine that greatly increased the West’s distrust of Moscow. That was followed by a gradual relaxation of tensions – a “reset” in relations with the administration of President Barack Obama, a warming of relations with Nato, the European Union and Britain, greater co-operation with the West over Iran, a flexible approach to Ukraine and a call to avoid a new flare-up over gas shipments. 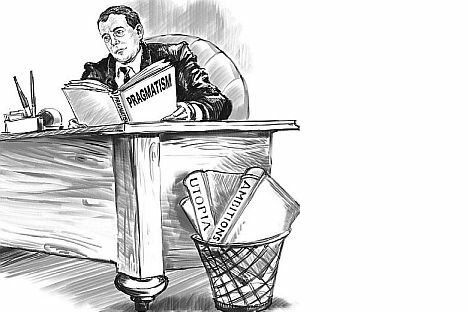 But developing specific criteria for what constitutes pragmatic government policies is complicated, because the word “pragmatic” has never been clearly defined in political terms. There seems to be nothing new in these statements, and yet their tone differs from what we are accustomed to hearing from Russia’s post-Soviet leaders. The task from the early Nineties until only recently has been the integration of Russia into the international community of developed countries. In the mid-Nineties, Russia was overly eager to join Western institutions on their terms and conditions. And although Moscow’s policy toward the West changed significantly during Vladimir Putin’s two presidential terms, the general goal of integration remained consistent through the Boris Yeltsin and Putin presidencies – at least up to the last year of Mr Putin’s second term. Mr Medvedev has referred to the West several times as a rich source of investment and technology – a “reservoir” from which Russia can tap the “intellectual resources of post-industrial societies”. The task of making Russia an integral part of that reservoir cannot be compromised based on political factors. The political focus on values, which until recently was the basis of relations with the West, has clearly ended. The current shift in Russia’s foreign policy is the result of various factors. The first is that Russia’s leaders are disappointed with the results of the last 15 years of efforts at integration. Second, shifts in the global economic balance has weakened the West’s monopoly on the world’s modernisation reservoir. For the first time, the theme of modernisation is not tied exclusively to Europe, but includes the Chinese, South Korean and Singaporean models of development. Mr Medvedev has a feasible plan to base relations with Europe on business interests alone. Mr Putin’s recent visit to France, where officials discussed a wide range of business deals, became a concrete illustration of Mr Medvedev’s statements. Certain that profits are more important than ideology for Western countries, Mr Medvedev said: “We know that our partners are counting on a rapprochement with Russia to realise their own priorities.” But betting on pragmatism requires that one condition be fulfilled: the ability to guarantee the rules of the game. That can be called a stable investment climate if those guarantees are based on the rule of law. The other option is authoritarian stability, and this is achieved through political agreements with members of the ruling circle. But whatever hopes that Russia’s leaders might hold, the lines between commerce, state bureaucracy and law enforcement continue to be blurred. This makes it impossible to give investors any reliable guarantees. Even when Western corporations believe that they can still make a profit despite the lack of legal guarantees, injustices, such as the death of corporate lawyer Sergei Magnitsky, will cause many Western investors to think twice before they increase their Russian exposure. Russia’s reservoir philosophy is aimed at using the resources of the West to boost technological and economic modernisation. The problem is that it does not set social modernisation as its goal. Russia needs social modernisation most of all – without which all attempts at achieving technological modernisation are bound to fail.